What to do about a painful inflamed bursa on the top of my foot, inside of my instep? A bursa formed on the inside of my foot right above the middle of my instep after the Lapidus procedure that I had 20 months ago to correct a severe bunion. The bursa is 1 inch in diameter and almost .5 inches in height. 4 months after Lapidus procedure I started physical therapy for 3 months. 6 months post the Lapidus procedure I had Iontophoresis treatment on the bursa. The Iontophoresis had a number of side effects after the first full treatment and I was not able to continue more treatments. 9 months after the Lapidus procedure, I had the hardware, metal plate and 4 screws removed from my foot. The bursa still remains and is swollen and painful. 18 months post Lapidus procedure I started manipulation therapy on foot scar and bursa for 8 sessions. Bursa became more inflamed and more painful after this manipulation therapy. 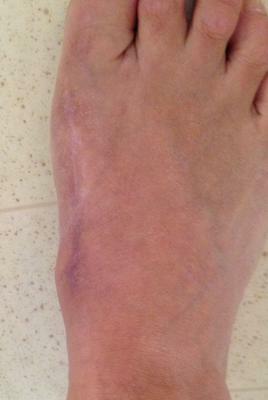 20 months post Lapidus, the podiatrist made an attempt to drain the bursa by aspiration. No fluid could be removed and the bursa remains painful and inflamed. Please advise. Is there other options or is surgical removal of bursa the only option? Maybe I am missing something here in your narrative, but why didn't your doctor remove the bursa when he removed the hardware in your foot? That would make the most sense to me, especially since he had tried other treatment and you also had physical therapy with no relief. I cannot really make out the picture very well, but other considerations would include a granuloma and scar tissue, both of which can occur after surgery, both can be painful and neither one can be drained. The bottom line is if the growth could not be drained, whatever type of growth it is will have to be excised.